Can we take a minute to talk about how it’s almost August? Can we all collectively look around and wonder where on earth our summer went to? I still have a whole lot of summer living to do! I haven’t been to Toronto Island at all this summer! I haven’t gone hiking, taken a day trip anywhere, I need some serious time up the cottage still. I have had many, many backyard barbecues, one cottage trip, many drinks on patios, an obscene amount of ice cream cones. . . but that’s not enough! I have so much to fit into this last month of summer! One thing I’ve done well this summer is food. Particularly awesome, decadent breakfasts in my garden. The boyfriend and I will sit out on a Saturday or Sunday morning, eating too much food, drinking too much tea (for me) or coffee (for him) and just relaxing. Enter waffles. Oh waffles. You delightful, mysterious creatures. I had eaten waffles before. From a box. Warmed in a toaster. Then one day I went to Hogtown Vegan and had their UnChicken and waffles. And my mind was blown. I hadn’t known that waffles could be that delicious! That they could be fluffy and and crisp and sweet. Not slightly soggy and freezer burnt. 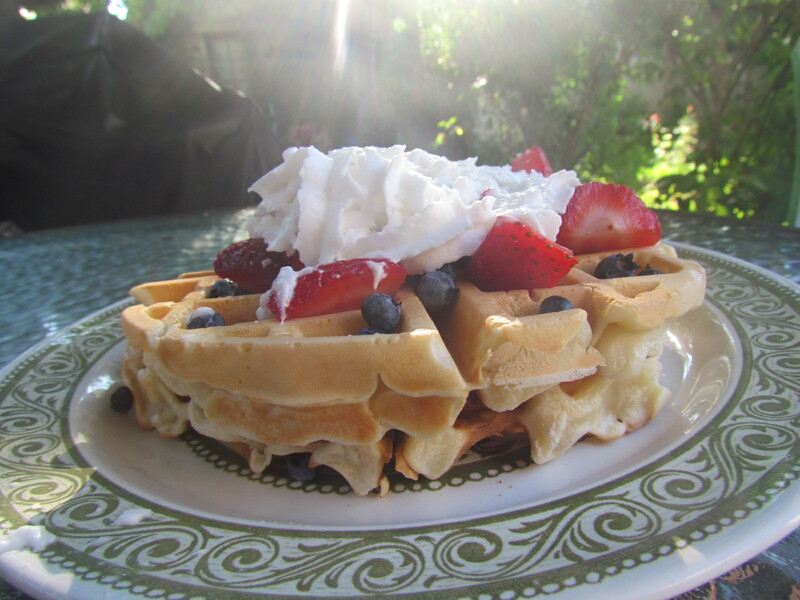 Then one day we bought a waffle maker and low and behold the world of waffles opened up to me. 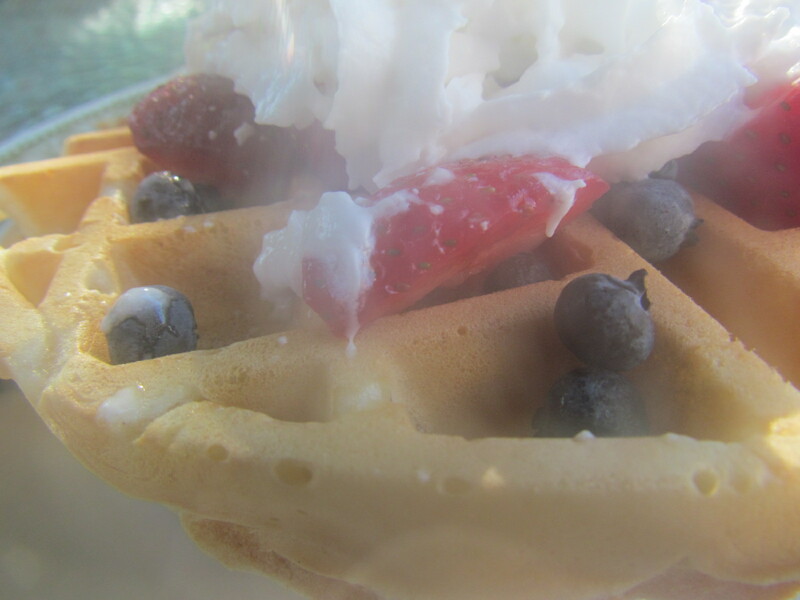 times I had gone out for brunch and watched people eat decadent waffles piled high with fruit and whipped cream. Now in a short span of time I can have that same deliciousness. 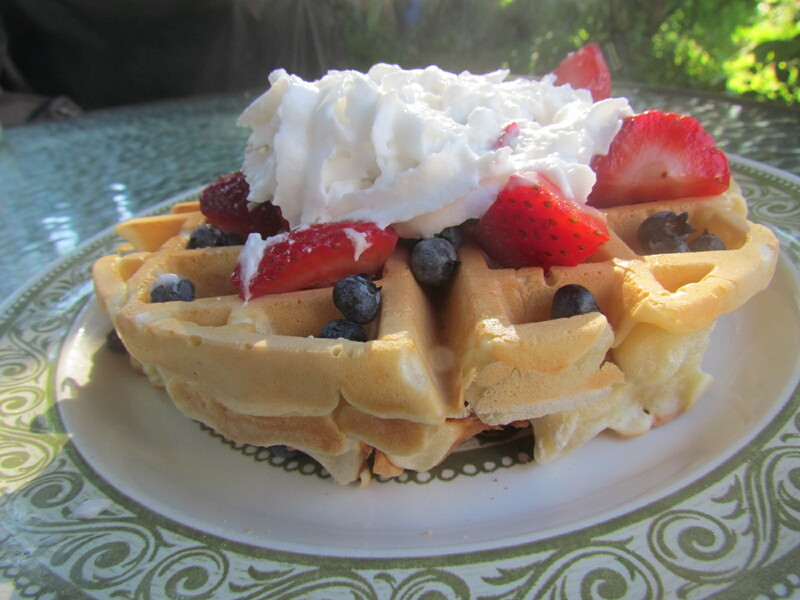 I found the most amazing waffle recipe online. Seriously. I tried out a couple of waffle recipes from cookbooks I own and while delicious they didn’t hold that waffle shape, they fell apart too easily. Not with this recipe. The recipe is over at Art of Dessert. The title of the post is best vegan waffles ever. I whole heartedly agree. The boyfriend claims they taste just like the regular egg filled waffles you would get for a fancy brunch at a restaurant. Of course instead of real whipped cream I used coconut whipped cream. Quick confession? I didn’t make the coconut whipped cream, I bought it. In a can! Yes, you read that right you can now buy coconut whipped cream in a can. I saw it at the grocery store and I couldn’t resist. It’s actually really good. I will be sticking to making my own coconut whipped cream in the future, but it’s nice to have another option. Sometimes I buy a brand of coconut milk that takes forever to solidify in the fridge and when that happens I can run down to the store and buy an emergency can of coconut whipped cream. These waffles would be good with just a little maple syrup, or a little bit of jam. But we decided, go big, or go home. We loaded them up with fresh fruit and coconut whipped cream. I love this time of year because Ontario fruit is in season. I got wild blueberries at the farmer’s market as well as strawberries. They aren’t massive like the one’s we’re used to at grocery stores but they pack about 100 times the flavour in. There’s a weird glow from my camera on these pictures, but I like it. 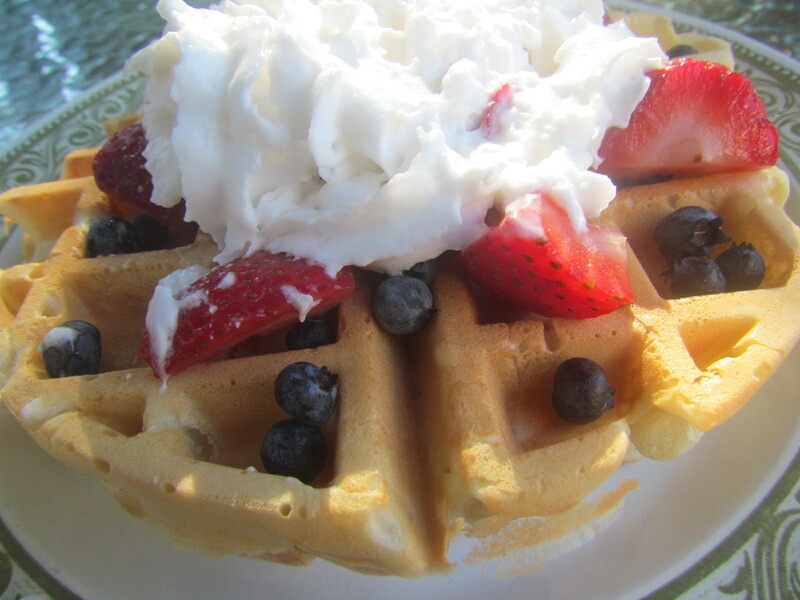 Makes the waffles look heavenly, which they absolutely are! Garnish with water you so choose! < Previous Do you like Pina Coladas? Vegan Cocktail Cupcakes!